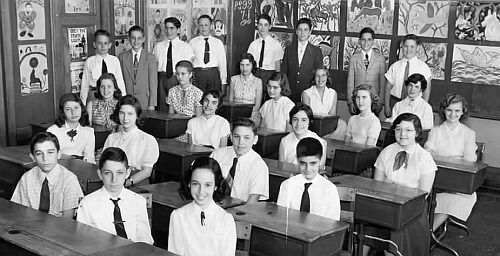 A Picture History of Kew Gardens, NY - Class Pictures - PS99 Grade7-1 1954. Students: Standing ( Left to right) Steven Lowe, Eric Wolff, Bruce Ettinger, John Young, Arnold Gold, Stuart Rachinsky, Harold Schild, Martin Martel. 1st Row across: Benny Hakimi, George Blitz, Ann Miltenberg. 2nd row across: Deborah Weinberg, Judith Felner, Steven Hilzenrath, Michael Pascal. 3rd row across: Carol Mazarsky, Ellen Gelpar, Harriet Brownstein, Nancy Blumberg. 4th row across: Betsy Simpson, Joan Pfeffer, June Leaman, Elaine Mihalic. 5th row across: Lucinda Beneventi, Ann-Judith Silver, Ann Brilmayer.